The Molly Maguires story is a fascinating insight into both Irish – American culture in the 19th century and America’s often troubled and brutal labour history. The Mollies were a secret society based among the Irish coal miners in the anthracite fields of northern Pennsylvania in the 1860s and 1870s. Conditions for the workers in this period were dreadful and coal mining was a dangerous and poorly paid profession. Out of 22,500 miners working in Schuylkill country, 5,500 were children and some child labourers as young as five years old were employed by the coal companies. Another cause of complaint was the ‘company store’. Workers would have to buy their provisions from a mine owned store at hugely inflated prices. In many instances the workers would end up owing the company more money than they were paid just to buy the essentials of life. The Molly Maguires were a transplanted sort of Irish rural secret society of the kind that had traditionally resisted attacks on their communities by landlords and their agents through violence and intimidation, but transferred to the coal mines of Pennsylvania and the struggle between miners and management. Despite the ethnic rivalries among the miners (particularly between Irish and Welsh) they managed to organise themselves into a union, the Workingmen’s Benevolent Association. The Great Panic of 1873 (one of the worst depressions in American history) gave mine bosses the opportunity to attack the wages and conditions of the miners. They imposed a new contract on the workforce which lowered pay rates by between 10 and 20%. This led to the Long Strike of 1875 which lasted seven months and saw the governor order in troops to the region. The strike ultimately failed.The miners were forced to return to work under the new rates of pay and the union was badly damaged. After seeing their attempts to redress their grievances through the union fail, some Irish -American miners turned to tactics that had been employed in Ireland in the late 17th and 18th centuries by groups such as the Whiteboys, the Ribbonmen and the Terry Alts – in other words oath bound societies, anonymous threats and in some cases violent retribution on those deemed hostile to their community. The Molly Maguires society emerged from this background. Instead of Anglo–Irish landlords, RIC men and their agents, the new targets became mine owners, company policemen and strike breakers. Intimidation, assaults and sometimes murder were employed by the Molly Maguires to rectify the grievances they felt would not be dealt with by a legal and political system that was hostile to immigrants and the working class. Many of the Molly Maguires were members of the Ancient Order of Hibernians, although not all Hibs approved of the tactics of the Mollies. Franklin Gowen was president of both the Philadelphia and Reading Railroad and the Philadelphia and Reading Coal and Iron Company. He brought the mine owners together in the Anthracite Board of Trade and his response to the Mollies was to hire the Pinkerton Detective Agency to root out the Molly Maguires from the coal fields. Armagh native, James McParland was selected to infiltrate the Mollies and report back to the Pinkerton agency on their actions. 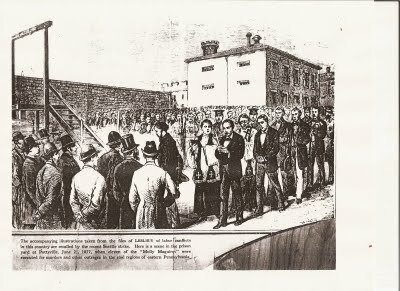 The trials of the Molly Maguires began in 1876 with the star witness for the prosecution being James McPartland. Franklin Gowen was the chief prosecutor and according to a Pennsylvannia judge at the time, ‘The Molly Maguire trials were a surrender of state sovereignty. A private corporation initiated the investigation through a private detective agency. A private police force arrested the alleged defenders, and private attorneys for the coal companies prosecuted them. The state provided only the courtroom and the gallows.’ The trial also gave Gowen the opportunity to tar the Ancient Order of Hibernians and the union as one large Molly Maguire conspiracy. 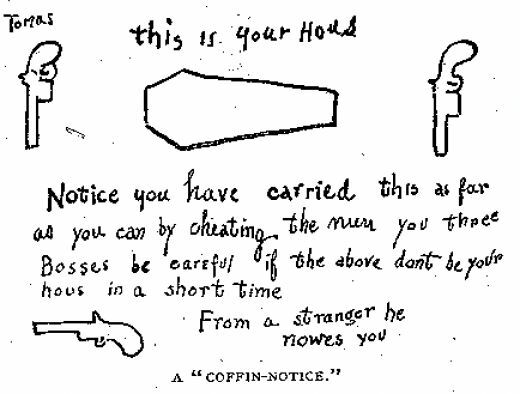 Twenty men were convicted and hanged on the basis of very dubious evidence for their part in the Molly Maguire conspiracy. Twenty men were convicted and hanged on the basis of very dubious evidence. John Kearns provided a very interesting take on the Mollies and has written extensively on them, including a stage play which was produced in New York City. To some Irish – Americans, the Molly Maguires Trials represented the epitome of a bigoted, nativist system that was prejudiced against immigrants and Catholics and, in particular, against Irish people. To others, the Mollies represented a hangover from the old country that they wished to escape. The violent, Gaelic speaking, illiterate, manual labourer was not an image some Irish – Americans, who were beginning to assimilate into American society, wished to embrace. 8 Responses to "The Molly Maguires"
An interesting piece on a little-discussed aspect of Irish American- history. I am moved to read the play.